Dialogue Incorporated: The Allure: Quaker Oatmeal | GO HUMANS GO! The Allure: Quaker Oatmeal | GO HUMANS GO! Evidently not even oatmeal is free from the need to spend millions on advertising. At least for Quaker Oats, who fall under the Pepsi Co umbrella, those millions are being spent cleverly (in my humble opinion anyway). I’m not sure if this is the case in your city, even though there’s no doubt this is a national campaign, but in the last 2 to 3 weeks the popular oatmeal brand has rolled out an extensive new ad campaign championing humans and their get up and go here in their native Chicago, IL. Created by Goodby, Silverstein & Partners, the campaign channels Quaker’s long held message of being the perfect breakfast fuel. 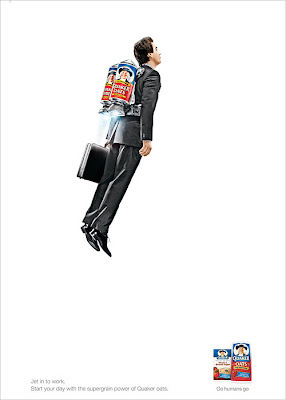 The campaign centers around the tagline “Go Humans Go” and their sleek, minimal imagery shows everything from the Quaker Oats man telepathically communicating “go humans go” via his iconic grin to suit & tie clad business men embarking upon their day with rocket propelled Quaker oats canisters. While some have apparently over thought the campaign, criticizing it for implications that the Quaker Oats man is not human in his cheering on of our sub-species or that the slogan is a tongue in cheek copywriting joke, referencing oats digestive qualities, I personally think this campaign is a testament to clever, aesthetically pleasing, and effective advertising. The presentation is clear and concise, the visuals are clean and eye catching, the campaign (whether in a positive or negative light) is obviously buzz worthy, and the message is as on point as any ad man or boardroom exec could ever ask for. While it may not have successfully woo’ed me away from my breakfast of choice (everything bagel with brie) it has yet again reinforced my fascination with advertising and its ability to communicate. I am in love with these ads. I kept pointing them out to Amanda these weekends. And then I had oatmeal for lunch today. That ad campaign is aggressively stupid. 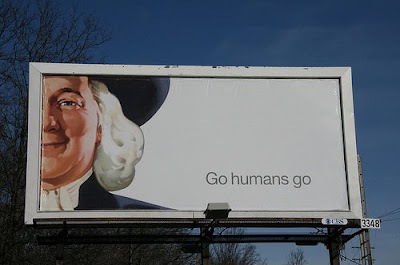 First of all, why is the William Penn guy saying "go humans go"? Is he supposed to be some kind of all seeing space alien dude sent here to oversee our species or something? And if so, why is he dressed like a farmer from the 1800's? Look, it's creepy, it's stupid and they don't even talk about oatmeal!!! How disgustingly human centric. The sad thing is we all buy into this kind of thinking. Why do we feel so entitled? No one ever thinks that maybe the Earth was not made JUST for us. That evolution did not culminate with us. That's what religion and our Culture ingrains in us from the day we are born. We are special and superior, we are the chosen ones. Hmmm...I giggled incessantly the first time I saw this new tv spot! All I could think about was the fact that OATMEAL makes you GO (keeps you regular, etc!?). So..."go humans go" just makes me think of people running for the toilet after loading up on high quality, tasty, Quaker fiber! Very well put! I had the intention of writing a similar post, for posterity's sake - making sure that there was something out there that spoke to the messaging behind the ad (intimating that the quaker oats guy is not of this world). I was surprised at the time that it didn't result in more reaction in the media. I'm also surprised it didn't spawn/inspire viral spin-offs. I think it's a hugely aggressive and risky move for a brand name like quaker oats and (for that reason) I love them for it. I think it might even be my favorite ad. Very nice pick-up on the "telepathic" item - I would have missed that point but it's essential.